Namibia is getting more and more popular as a place for destination weddings, and that’s totally understandable. We have got the most scenic surroundings, friendly people, stabile conditions and a good infrastructure. Amelie and Florian had their destination wedding in Namibia, and I had the honour of capturing the memories of their big day. They chose to have the wedding at Namibgrens Guest Farm, and that was a good choice. Namibgrens is close to the scenic Spreetshoogte Pass in a breathtaking environment, but not too far from Windhoek. Their rooms (they call them villas) have panoramic windows and are beautifully integrated into the landscape. They even incorporated the local rocks into the rooms, and it adds to the very special ambiance. The wedding was conducted by Fourie van den Berg. I have taken photos at a number of weddings that he officiated, and he has always found the right words. I can highly recommend him to anyone who wants to have a wedding that is a bit different than the traditional church service. The wedding ceremony took place at a beautiful scenic viewing point. 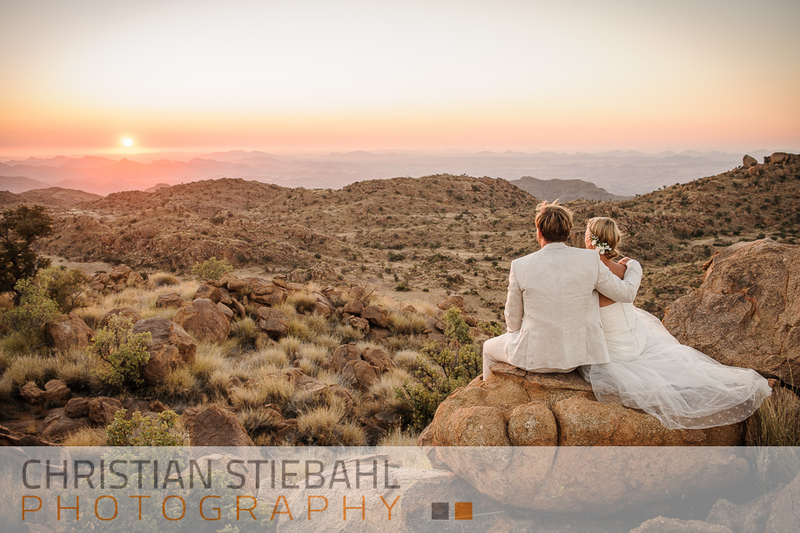 While the guests were witnessing the ceremony they could let their eyes wander over the serence Namibian landscape. In true Namibian fashion a sundowner was served after the ceremony and we had the opportunity to take some spectacular photos of the couple and guests in the stunning environment. After the sun had set and everyone had freshened up the Namibgrens team had prepared a scrumptious dinner and everybody indulged. The first dance followed, and soon everybody joined to top off a perfect wedding in Namibia.